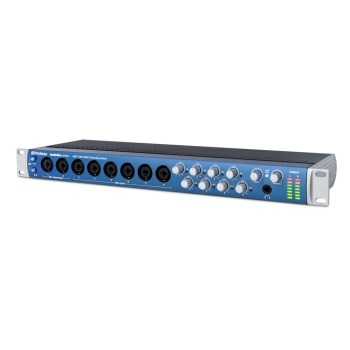 The flagship in PreSonus’ new generation of USB 2.0 audio/MIDI interfaces, the AudioBox 1818VSL takes hardware/software integration to the next level and delivers a combination of features, audio quality, and value that is unprecedented in this product category. Using your computer CPU and PreSonus Virtual StudioLiveTM (VSL) software, AudioBox VSL-series interfaces provide reverb and delay effects and the same Fat Channel compression, limiting, semi-parametric EQ, and high-pass filter, as the PreSonus StudioLiveTM 16.0.2 digital mixerâ€” all with inaudible latency. It’s a great choice for project studios, performing bands, school music labs, and a wide variety of corporate installations and other contractor applications. This is a pro product all the way, with high-end 24-bit, 96 kHz converters; Class A XMAXTM preamps; ADAT optical I/O; S/PDIF coaxial I/O; word-clock output; and MIDI I/O, housed in a heavy-duty, rack-mount metal chassis. Furthermore, thanks to the power of VSL, the AudioBox 1818VSL includes a 26x8 software mixer. As a result, with just an AudioBox 1818VSL and your laptop or other computer, you can mix a studio session or live show featuring a full bandâ€”all while monitoring and recording with or without real-time effects! And you can do it simply and easily, with no hardware mixer, no outboard effects rack, and minimal wiring, thanks to the tight integration between PreSonus hardware and software.